Prof. Sudipto Dasgupta is currently a Professor at the Department of Finance at The Chinese University of Hong Kong. He previously held academic positions at Lancaster University (where he was Distinguished Professor of Finance), The Hong Kong University of Science and Technology (where he was Department Head during 2013-2015; Chair Professor from 2008, and Professor from 2004), The Jawaharlal Nehru University, The Indian Statistical Institute, and The University of Southern California. He has been the Managing Editor of the International Review of Finance since 2008 and is a Senior Fellow of the Centre for Economic Policy Research (CEPR) and the Asian Bureau of Finance and Economics Research (ABFER). Prof. Dasgupta obtained his Ph.D. in Economics from the University of Southern California in 1988 and has been teaching Finance since 1993. He has broad research interests with a focus on Corporate Finance. Prof. Dasgupta’s early work was on Applied Game Theory and the Theory of Industrial Organisation. He worked on the design of procurement auctions and on takeover bidding environments. He later worked on topics such as the role of firm leverage on worker-firm bargaining, on information sharing among competing firms in an oligopolistic market structure, and the effect of leverage on product market outcomes. Most of this early work was theoretical in nature. His more recent work includes papers based on empirical methodology and he has examined such issues as the capital structure policy of firms, the effect of financial constraints on firm behaviour, including inventory investment and the allocation of cash among alternative uses, the reputational effects of large customer accounts on the loan spreads of supplier firms, whether the managerial labor market rewards top executives for their perceived ability, whether more intense product market competition increases firm efficiency by accelerating the replacement of less efficient managers, and so on. 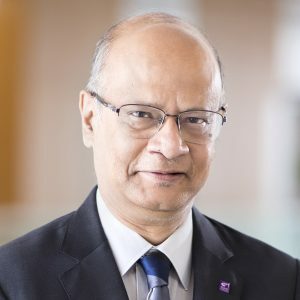 Prof. Dasgupta has regularly served on the program committees for meetings of the Western Finance Association, the European Finance Association, the China International Conference in Finance and the Financial Intermediation Research Society (FIRS), and has served as session chair for all the major conferences. He was a program co-chair for the China International Conference in Finance for 2013 and 2014, and the CEPR Annual Conference in Finance for 2017 and 2018. He was a board member of the FIRS from 2013-2015. He was a member of the Nomination Committee of the American Finance Association in 2011.